A year ago I wrote about the mysterious pineapples that appear on our doorstep from time to time, a gift we eventually traced to a neighbor who lives across the courtyard from us. Yesterday, when returning home, we found a large object wrapped in newspaper sitting on our doorstep, too large to be a pineapple. What was it? The largest papaya I’ve ever seen. Hopefully, we’re going to have a hoard of fruit eaters descending on us soon because I don’t know how we’ll ever finish so much papaya just by ourselves. Oddly, left with the payapa was the handle of a shovel. Just the metal handle, not the woden shaft or the blade of the shovel. Strange, huh? This entry was posted in Uncategorized and tagged Fruit, Gift, Mystery, Papaya by christao408. Bookmark the permalink. I am not a fan of papaya; don’t find it tasty at all. 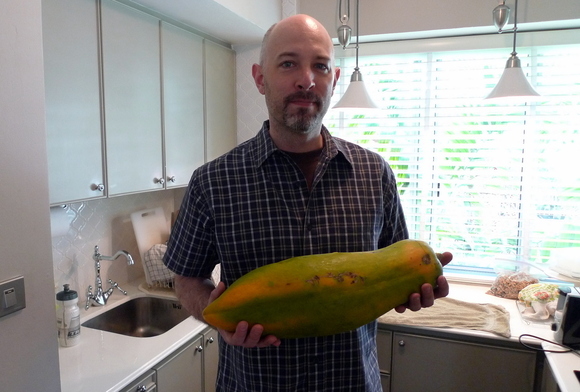 whoa, that is a HUGE papaya! my parents would love it, but i’m actually not a big fan; i have to be in the mood to eat papaya. i’m sure you’ll come up with some creative ways to use it! I’ve never had papaya. What would you make with it? Wow! That’s massive! I hope it’s as tasty as it looks =). Stalked by a fruitarian. Look out, it’ll be kiwis flying through the windows next, and then the monster watermelon!Lovely papaya. It looks like the tropical variety, not the Hawaiian kind. I think of papaya and I think of dried fruit… We never get good papaya in IN. Even the ones at the store are tasteless. Enjoy! Papaya sherbet? If you can’t finish it, juice it. I suggest freezing part of it for later juicing. Dad and I buy large papayas from south of the border and eat a bit of it each day on our fruit plate. They keep well for quite a long time. strange indeed. i don’t what is a regular size of papaya in thailand, but that’s a regular size for papaya here in indonesia. i can eat all that within a day. what strange yet nice neighbors! We would love that kind of neighbor!